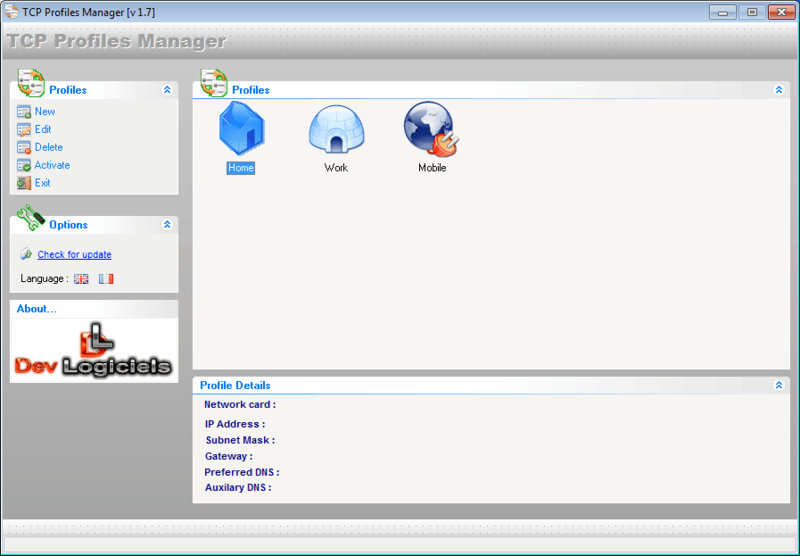 TCP Profiles Manager is a free software program for Microsoft Windows devices to use multiple network configurations. Even the latest version of the Windows operating system does not offer options to maintain multiple network profiles if only one network adapter is installed. While that is not a problem for most desktop PCs, it can become quite a nuisance for IT workers who use their mobile PCs to connect to different work related networks. Manually changing a network adapter's IP address and other network related information may be an option if done irregularly, but a software to automate most of the process could save a lot of time if you have to do so regularly. TCP Profiles Manager is a basic software for that purpose. It supports the creation of multiple network profiles but limits the parameters that may be changed to TCP/IP and DNS settings. The program on startup displays a list of available profiles and options to create, delete, edit and activate profiles in the left sidebar. First time users should make sure that English is the selected language of the program. As a side note, the installation was only available in French, the software itself in English and French. A new network profile requires the selection of a name, icon, network interface, either manual or automatic IP address settings, and a manual or automatic selection of DNS servers. You can create an unlimited number of network profiles and switch between those whenever the need arises. TCP Profiles Manager lacks some of the features that previously reviewed applications offer including import and export options. Network Settings Manager for instance offers options to configure default printers, network drives, WINS or scripts for each network profile. Even the similar Network Profile Switcher supports plugins to change settings like the Internet Explorer proxy automatically for each network profile. 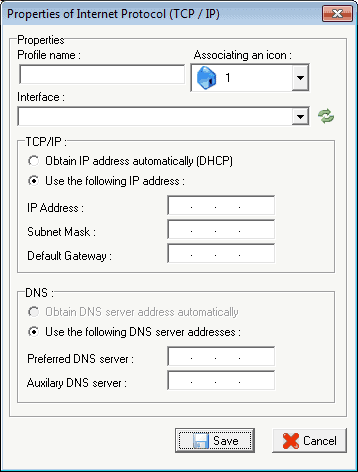 Still, Windows users who are looking for a program that changes IP and DNS related network settings automatically, may take a look at TCP Profiles Switcher. Advanced users, and users who require more functionality may be better of with NetSetMan. TCP Profiles Manager is compatible with 32-bit and 64-bit editions of the Windows operating system. It has been tested on a Windows 7 Pro 64-bit system. Tested on Win7 64b. Only works if run as admin or check option at shortcut. Support XP, Vista and Seven. I like this software.